Hooray for Neil Gaiman! Hooray hooray hooray. Or as he would say, Hurrah. American Gods was sweeping and grand and epic. I loved it. 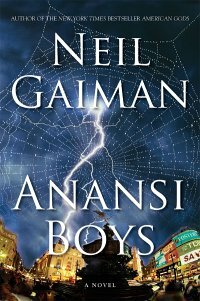 Anansi Boys was on a smaller, family scale, funny and sweet. I loved it. Do you miss Douglas Adams? Do you lie in bed at night, depressed that there will never be another Dirk Gently book? Well, weep no more. (Yes, yes, I am still sad about Douglas Adams. I'm not being flip about his death. You know what I mean). I think that Neil Gaiman was channeling Douglas Adams while he wrote this book. And, actually, P. G. Wodehouse might have dropped by for some of the plotting. So. A combination of Neil Gaiman, Douglas Adams, and P. G. Wodehouse. Could things get any better? Fat Charlie was only ever fat for a handful of years, from shortly before the age of ten, which was when his mother announced to the world that if there was one thing she was over and done with (and if the gentleman in question had an argument with it he could just stick it you know where) it was her marriage to that elderly goat that she had made the unfortunate mistake of marrying and she would be leaving in the morning for somewhere a long way away and he had better not try to follow, to the age of fourteen, when Fat Charlie grew a bit and exercised a little more. He was not fat. Truth to tell, he was not really even chubby, simply soft-looking around the edges. But the name Fat Charlie clung to him, like chewing gum to the sole of a tennis shoe. He would introduce himself as Charles or, in his early twenties, Chaz, or, in writing, as C. Nancy, but it was no use: the name would creep in, infiltrating the new part of his life just as cockroaches invade the cracks and the world behind the fridge in a new kitchen, and like it or not--and he didn't--he would be Fat Charlie again. It was, he knew, irrationally, because his father had given him the nickname, and when his father gave things names, they stuck. Fat Charlie's knowledge, while irrational, is true. His nickname has stuck with him because his father, Anansi, gave it to him. When gods name things, those things stay named. Fat Charlie didn't know that his father was a god until after his father's funeral. He also didn't know that he had a brother. Fabulous, fantastic, perfect. Neil Gaiman writes like his loves it--at times, it seemed like I could feel his joy for storytelling--it felt gleeful, even--just bubbling out from underneath the words. (If you read this, Neil Gaiman, and that isn't true--if secretly you didn't have fun writing this book at all, and if just reading about it makes you want to throw up--please don't tell me. Leave me with my illusions. Although, if you were faking it, you did a stupendous job). Who doesn't miss Douglas Adams? Did you know that Neil Gaiman wrote "Don't Panic: Douglas Adams & The Hitchhiker's Guide to the Galaxy"? I enjoyed the heck out of Anansi Boys as well and thought you might be interested in my two cents.